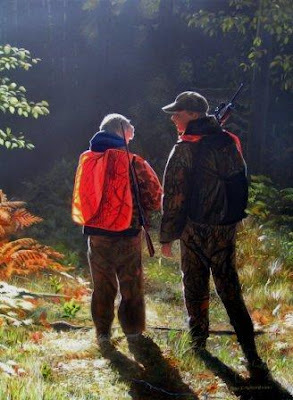 The print Lessons, which features one of those important moments in life that happen between a father and a son, is now available on the Cabela's website. It has been available in their stores for about a year, but now is available online as well. Artist Proofs of the print are available through my website - www.mathiosstudios.net. This 8" x 10" study has been revised from the one that is a few entries below. A lead wigeon has been added closer to the viewer and a bird has also just landed in the water. Some of the reeds have been subtly modified as well to help the ducks stand out a bit more. This gives the painting added life while keeping the hunter's perspective. The study is for a larger commissioned painting for the St. Clair Flats Waterfowlers Incorporated conservation group. 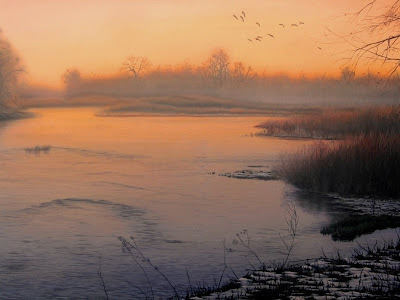 Image Size (unframed): 15" x 20"
Throughout the past year, the regular edition prints of South Platte Sunrise were used to raise money for upland bird habitat at Pheasants Forever banquets throughout the country. Now the remaining prints from the Artist Proof edition are available. The edition size is 50 prints and only 22 of those remain. To see more available prints, click here.